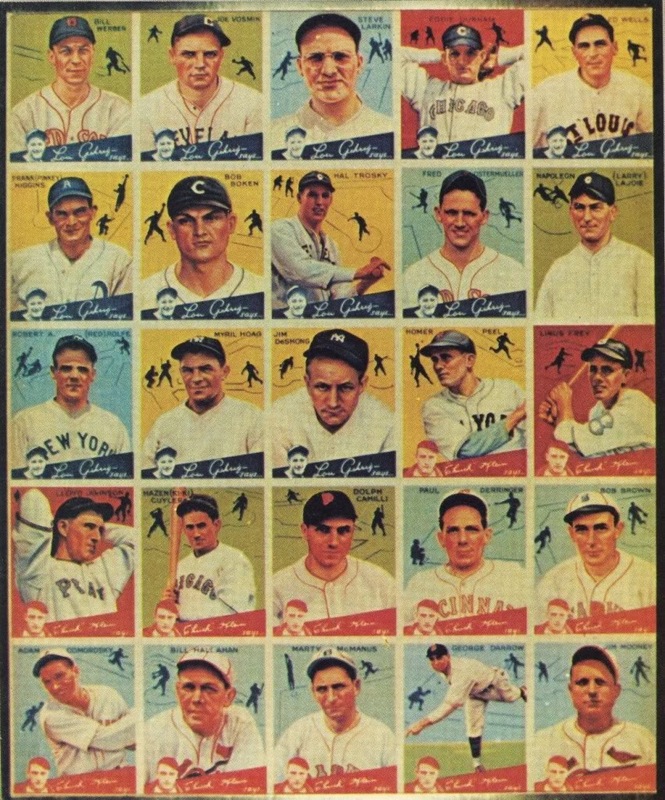 Goudey published several "series" of Big League Gum cards in 1934, four runs of 24 players each, for 96 cards total. 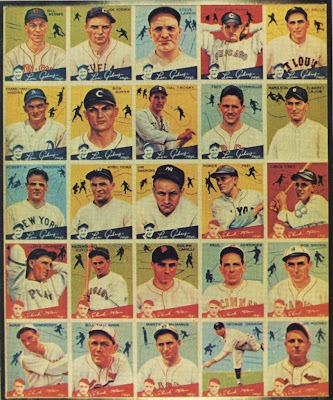 The above 5x5 card sheet comprised that final group, #73-96, with an extra spot for the "1933" #106 Nap Lajoie (green background near upper-right). 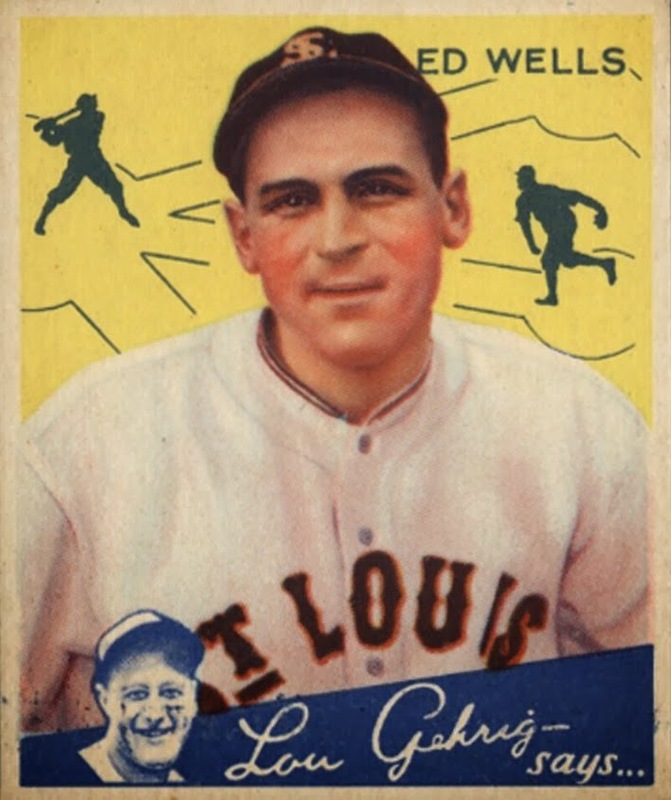 One can guess that a fourth run of cards would come out mid-season, but Goudey's inclusion of trivia questions, some from 1934 itself, narrows the release window to "post-May" and perhaps after that year's All-Star Game on July 10th. Let's start with its first card, Ed Wells, and flip him over to find this question. Hall of Fame manager John McGraw passed away in early 1934, so this question's a tribute of sorts. It's pretty esoteric to know who he "turned down," though. Big League Gum #85, Adam Comorosky, has the answer, or at least the factual part of it. OK, McGraw didn't get every call right. But according to Giants team historians, he passed sight-unseen on the Cooperstown talent of Lefty Grove thanks to bad feelings over missing out on Babe Ruth in 1914. The moral: don't hold grudges, kids. Each of the first twelve cards in that series (#73-84, all American Leaguers) asked a question answered by the final twelve (#85-96, all National Leaguers). Singles from the whole series are scarce and it's a pricy proposition to acquire all 24, so here's its full trivia list for hobby posterity, with relevant notes and links. #73 Ed Wells, Q: What pitcher was turned down by John McGraw? Martin's 26 thefts led the NL for 1933, but his Baseball-Reference page omits the 9 "caught stealing," implying it was kept unofficially at the time. #76 Hal Trosky, Q: What NL player has already played in over 2000 contests? That May 29th "triple play game" dates Goudey's fourth series to June, if not later. #78 Pinky Higgins, Q: Who has the highest lifetime batting average? #79 Eddie Durham, Q: What noted player has taken part in the most World Series games? #80 Marty McManus, Q: What was the longest game ever played? #81 Bob Brown, Q: What was the greatest number of scoreless innings pitched last year and who pitched them? #82 Bill Hallahan, Q: Who holds the modern major league batting record for a single season? #83 Jim Mooney, Q: Who holds the record for driving in the most runs in a single season? #84 Paul Derringer, Q: What pitcher holds the record for most consecutive games won? 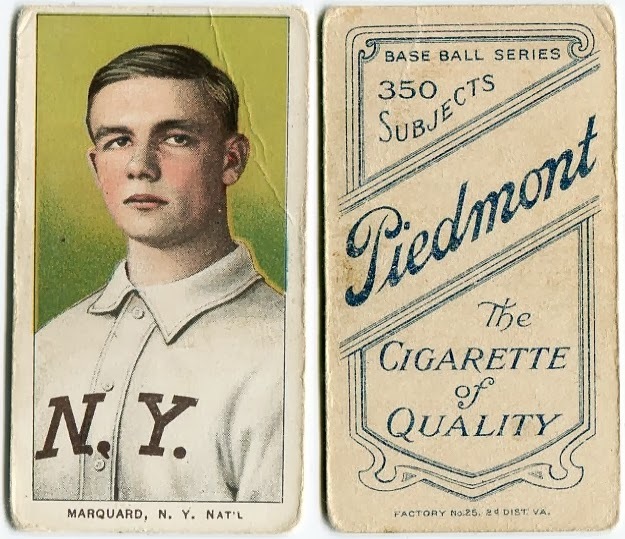 Marquard started his 1912 season by winning 19 in a row for John McGraw's Giants, the eventual NL pennant winners, and still holds this record. Check out "Winning Streaks by Pitchers" from the SABR archives for plenty more on the subject. 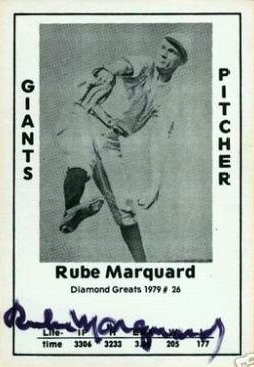 BONUS RUBE: Marquard was the last living player from another seminal set, T206 tobacco. He passed away on June 1, 1980, just long enough to appear in (and sign) the 1979 Diamond Greats set of then-living former players. As noted in my Diamond Greats set profile, Marquard appeared on vintage cardboard sets nearly 70 years apart, which might itself be another record. Trivia on top of trivia! Such was baseball and collecting, even back in the 1930s.